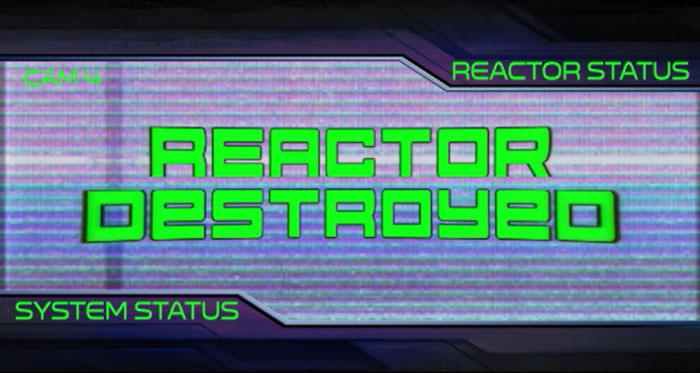 As many of you may or may not know, if you end up defeating reactor 9 in Total Nuclear Annihilation, you have successfully destroyed everything. This includes yourself. The game ends, killing your flippers and giving you a “Total Annihilation Bonus”. This bonus is a accumulation of all the destroy values that you earned throughout your journey defeating all 9 of the reactors, including the multiplier values while destroying. This bonus value will be very substantial. Since you have killed everything, including yourself at this point, any balls or extra balls that you have left over will be drained as well, but will give you the “Total Annihilation Bonus” for each left over ball. Again, this is huge. This brings me to my next fun bit of information. In the TNA service mode, there is a setting called “Annihilation After Reactor” and this is set to 9 by default. This will allow the operator to adjust after which reactor when Total Annihilation occurs. For 1 reactor battles against your buddies, simply set this service menu setting to 1. This will make reactor 1 the last reactor needed to beat the game. This will force you to play more efficiently than your opponents. The key thing to winning 1 reactor battles is you want to max out your reactor value, destroy the reactor in multiball, and do all of that on your first ball. Whoever can do this the best wins. It is finally here in all of its glory. Version 1.3.0 with many new features and bug fixes. Please see the change log below. The code can be downloaded from the link below as well. As always, let me know if you encounter any issues with the software and I can address them. Enjoy! - Fixed hangup on bringing reactor 3 critical! Posted in: How To, Total Nuclear Annihilation. I get asked this questions a bunch and figured I would do a quick write-up on what is needed to add light-up flipper buttons to TNA. Each of these items comes with instructions on how to install them. Obviously, install the Accessory Power Supply first and then the Britebuttons. The buttons will plug directly into the power supply using the 3 pin Molex connector. You can then power the machine up and set the mode you want using the details from the instructions in the BriteButtons. Hey there!!! Another TNA code update is here! This is a short, but good one. I have fixed a few bugs and added what I like to call “Speed Runs” to kill each reactor. What do I mean you ask? The game now displays reactor uptime on the display telling you exactly how many seconds each reactor has been online for. The timer starts as soon as the reactor start scoop has been hit and stops when the reactor is destroyed. 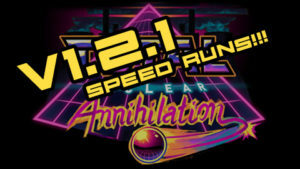 These speed times are stored in the high score table as “Reactor X Speed Run Champ”. There are 10 of these. One for each reactor and one for Total Annihilation! Every second counts when battling these reactors so be sure to skip the reactor startup animation and be sure to skip the bonus count at the end of your ball. Your reactor uptime pauses if another player is up, but the timer does not pause until after the bonus count. – Skillshot light stuck on is now fixed. WARNING: Updating code on your game will reset your audits and settings on the game after the update procedure. However, these audits and settings are automatically dumped to the USB stick as a backup for your reference. I am planning to add functionality to save audits within the game in the future. Step 1: Download the latest “pkg” file from the link above. Step 2: Copy the “pkg” file to a USB flash drive. 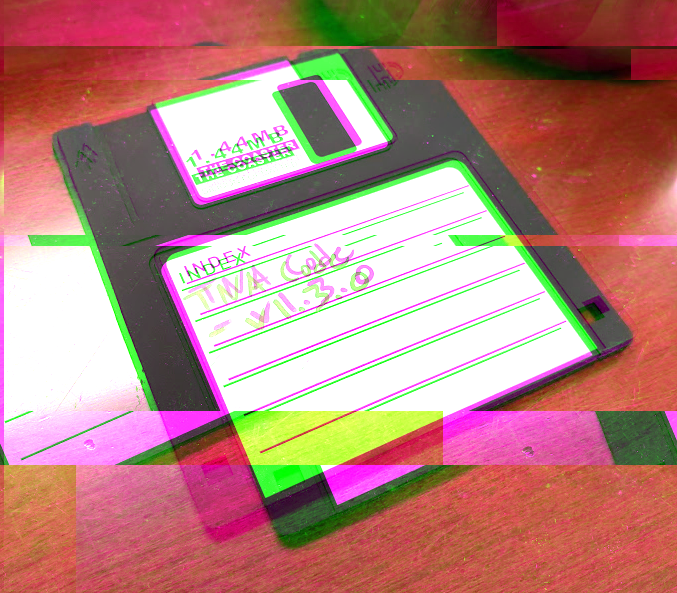 Do not change the name of the file, should be named “tna-gamecode.pkg”. Step 3: Power off the game and remove the backglass. Step 4: Insert the USB flash drive into an open USB port on the PC located on the right side within the backbox. Step 5: Power on the machine, a message should appear saying that the software is updating. Step 6: Once the code update is complete, remove the USB flash drive and restart the machine. 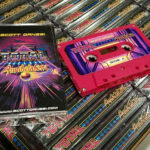 Hey Everyone, it has been a long time since I did an actual pinball related blog post, so here it is! I have been getting a ton of questions lately on how to properly power opto transmitter LEDs and how to hook up the receivers to the SW-16 P-ROC boards. I am going to walk through it in enough detail that you should be able to get up running on the concepts quickly. 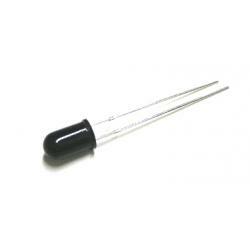 Opto transmitters are nothing more than high powered infrared LEDs. For this guide, I am going to be referring to the Williams/Bally style opto transmitter which can be seen here: https://www.pinballlife.com/index.php?p=product&id=170. This LED emitter has no circuitry attached to it by default. 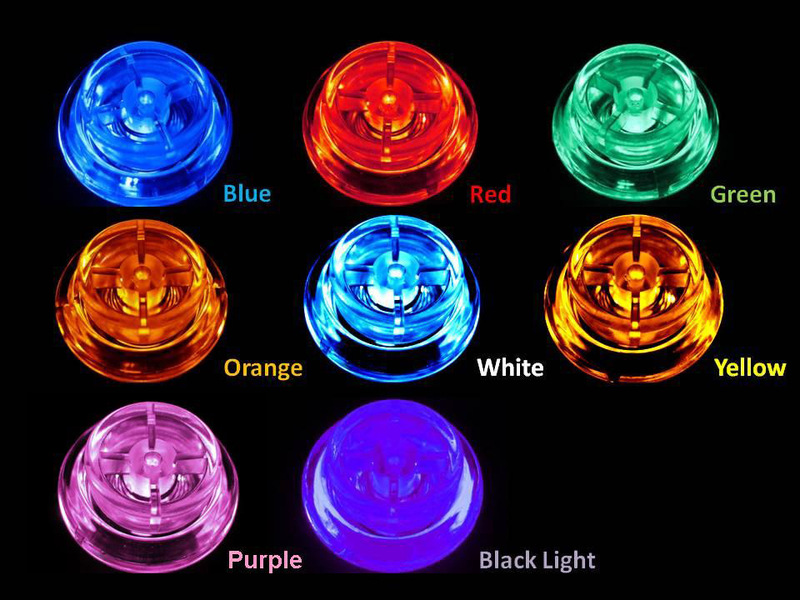 These LED emitters are also used on the small PCB and bracket assemblies seen here: https://www.pinballlife.com/index.php?p=product&id=168 and other various trough board assemblies. In order to safely power this LED, you will need to gather a few data points and make a couple small decisions. You will need to know the forward voltage of the LED, maximum constant current that the LED can handle, decide what input voltage you would like to supply to it (5v or 12v), and decide how much current you would like to give the LED to ensure it has enough power to transmit infrared light to reach your opto receiver. Max Constant Current: 100ma, but I recommend you do not exceed 75ma to maximize the life of the LED. This will be powerful enough to transmit a pretty decent amount of distance between the emitter and receiver. Input Source Voltage: 5vdc is my recommendation as it is higher than the forward voltage of the LED, and low enough that the resistor does not have to dissipate too much heat. These LED emitters will need a current limiting resistor in series with them as applying 5v or 12v directly to the LED will cause it to overload and fail. Now, to calculate this resistor value, we will need to calculate resistance and power based on the data that we have. 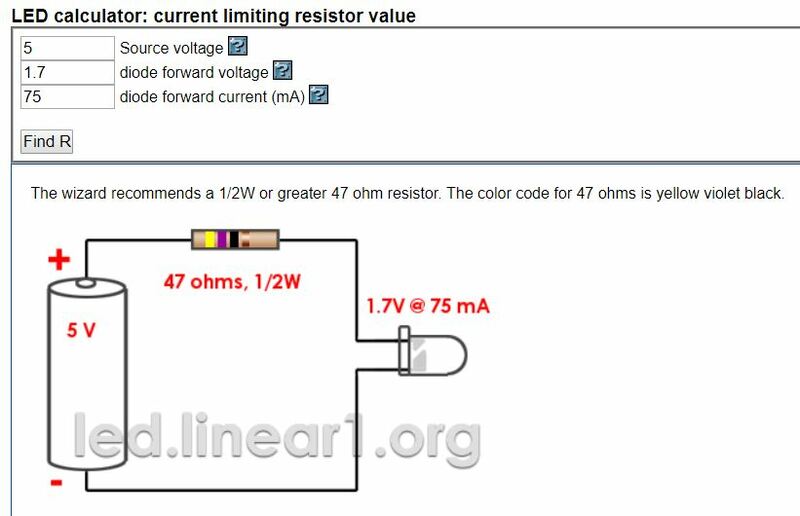 Now, I could be idealistic and talk about the actual calculations, but I am going to show you how I usually calculate this using an online LED resistor calculator. The one that I use the most is the one below. I have already filled out the fields, but feel free to change some of the values up to see what happens. So as you can see above, the calculator has automatically figured out what the ohms and recommended resistor wattage should be for our emitter. What I also like about this calculator is that it gives a nice visual representation of how to wire the circuit and what the resistor color bands are. That is about it for powering an opto emitter! 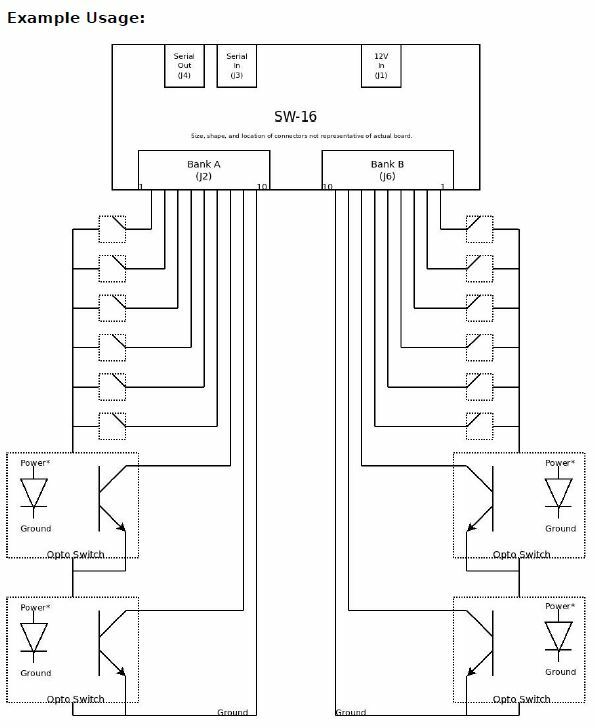 Now for this section, I am going to be talking about the Williams/Bally style opto receivers and how they hook up to the SW-16 P-ROC switch boards. These are the black colored opto receivers that can be fond here: https://www.pinballlife.com/index.php?p=product&id=171. 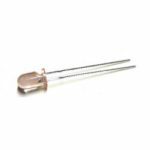 These, just like the emitters, are also used in small PCB assemblies, and trough opto boards as well. To connect these optos into the SW-16 P-ROC board, you will simply need to wire it directly to the inputs of your switch board. It is really that easy. It will act just like a standard switch as long as it is connected in the correct orientation. Below, you will see an image from the P-ROC documentation. The cathode/ground side of this diode is the side with the flat indentation on the black epoxy base of the opto. Please also keep in mind that opto receivers are normally closed switches and when it detects the IR beam from the emitter, it will open. This is opposite of a normal switch. When a ball breaks the opto beam it will go from a closed state to an open state. I hope this all makes sense and helps you get your project up and running! Please also keep in mind that some Stern and certain Williams trough boards have resistors built into them on the emitter side. The guide above will allow you to connect to boards and directly to emitters that have no circuit logic. 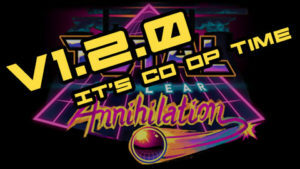 Total Nuclear Annihilation v1.2.0 Code Update and Co Op!!! The wait is finally over. I have finished up version 1.2.0 of the TNA code. 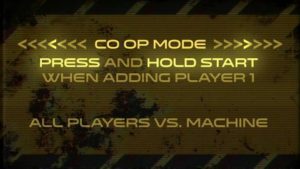 This new code update contains the new co op (all players vs. the machine) and the team vs. co op (players 1 and 3 vs. 2 and 4). There are also a bunch of other little fixes and additions. Please see the changelog clip below for more info. To start a game in co op mode simply hold the start button down for a few seconds when adding player 1. The game will flash a confirmation on the LCD and a callout saying that co op mode is enabled. This is standard co op mode, which is all additional players are working together as a team to destroy the 9 reactors. All scores are shared, no extra balls, replays, or high score tables are enabled. It is your team vs. the future, that is it. If you would like to make things a little competitive in co op mode, there is another co op type that can be selected. 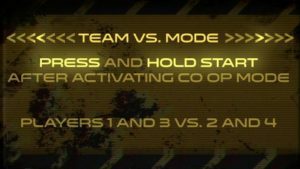 This other mode is team versus co op mode. This mode can be activated by pressing and holding the start button for a few seconds after the standard co op mode is enabled. This mode requires 4 players and will revert back to standard co op if not enough players are added before shooting the first ball. In this mode, players 1 and 3 will be going up against players 2 and 4. This is also called “odds vs evens” in some tournaments. All progress and scores are shared between each of the players within their respective teams. Just like standard co op, no extra balls, replays, or high score tables are enabled. As with any software release, please let us know if there are any show stopper issues on your game. Please contact service@spookypinball.com and we will get back to you asap. Thank you and enjoy! – Quickshot video lag issue fixed. – Major performance update for lightshows – Thank you Josh Kugler! – Co Op Mode added! – Team VS Mode added! – Orbit combo logic and scoring reworked now with multipliers! 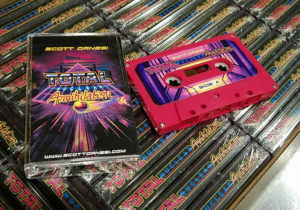 Posted in: Arcade Posts, News, Software, Total Nuclear Annihilation. The long awaited v1.1.0.02 code update is now live! So many changes in this version. Below is the changelog and the download link. Hope you enjoy! Please also keep in mind, this update will clear your settings and audits. As always, if you find any issues or show stopper exploits with this version, please let me know so I can get them corrected. Thank you! game over reset process. Still working on making this faster. Michael Ocean is awesome. – Fixed small video lag at beginning of first ball in the Welcome to the Future animation. – Significant video performance enhancements. – Fixed bugs in Ball Search functionality. – Fixed hard crash when trying to do a quick restart during the bonus count. – Fixed bug where angry player can tilt out the next player too easily. – Cleaned up unnecessary Ballsearch log error. – Fixed Secret Skillshot exploit. – Fixed attract mode ballsearch so it will not keep cycling if a player is too impatient for the balls to reset and drain. – Fixed log error when saving data files to disk. – Fixed tilt issue where prior player tilts after bonus. – Shaker now enabled and disabled properly without machine restart. – Shaker issue when starting mystery now disables properly. – Destroy Reactor ballsave now active when multiball is running as well. – Fixed Avg Ball Time Calculation. – Fixed Avg Score Calculation. – Fixed Avg Game Time Calculation. – Changed Coin Drop notification font. – Updated drop target handling logic to prevent balls from getting stuck in right scoop under specific conditions. – Fixed some other misc font issues. – Fixed flickering GI when lane changing the skillshot. – Fixed coin drop issue for coins with a value larger than a single credit. – Super jackpot will now add a ball into play for up to a 4 ball multiball! This also enables up to 4x playfield multipliers. Indicated with white colored flashing ball lock inserts. – Add A Ball is limited to 1 ball added per multiball. – Destroyed reactors now score 1 point each to store the player’s progress in the last digit of their score. Match will ignore this last digit and treat it like a 0. For example, if a player earns 100,000 points and destroys 2 reactors their score would be 100,002. – Reworking of display animations and notifications to clean up a bunch of things. – Lock Quickshot display and scoring updates. – Skillshot now displays score values when awarded. – Adjusted orbit timer from 5 seconds to 3 seconds. – Bonus now includes bonus total at end of bonus count. Also new lightshow and sound for that. 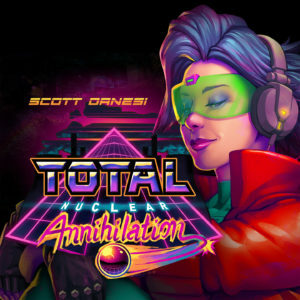 – Remastered music from the Total Nuclear Annihilation Album has been updated on the game. Also other various audio has been remastered throughout the game. – Last game scores are now saved and recalled after a hard reboot of the game on the numeric displays. This was needed in case there was a display error that requires a machine restart so the scores are preserved. – Locking a ball now awards 20k points. – All LED test now can stop on specific colors when pressing the enter or start button. – Jackpot Drop Reset Seconds is now configurable in the service menu. – Secret Skillshot now awards a default time ball save, but allows multiple saves for the entire save time. Awesome. – Add A Ball now enables default multiball ballsave. – Reduced overall RAM usage of PC significantly. – Early ball save added for cashing in a ball save on an outlane. – Added drop target test in service mode. – Added warning message on the display if drop target error is detected by the system. – Added Free Game Percent to Coin Op Audits. – Upper rollovers now advance reactor value and award a reactor shot when started. – New Tilt warning sound. Replaced the public domain missile siren with custom effect. – Mystery awards are now stackable, meaning you can light mystery more than once and the game will keep track of it for you and you can cash it is by hitting the scoop multiple times. – Ball save timer setting added to the add-a-ball ball save (separate from the standard ball save). – Reactor Keypad now more evenly distributes spotted targets when targeting a new reactor. – Ball saver will now pause for mystery award and reactor starting. – Replay award can be selectable between Credit or Extra Ball. – Multiball ball saver will now only save the first 3 balls drained. – Tilt switch sensitivity added to service menu. – Last scores now show on the LCD after game over. – Can now scroll through the individual high score categories in attract mode.